Foods I love, with baked mac and cheese. Since it's Valentine's Day and all, I thought I'd talk about a few foods that I love. Eggs. I love you always. Scrambled, fried, poached. Cooked with veggies in an omelet, placed sunny-side-up or over-easy atop a pile of anything edible, dropped into a bowl of soup for a rich, velvety touch. Avocado on toast. Now to be clear, I love avocados in any form. But I think it's safe to say that only true lovers of the avocado can love it in its simplest form, piled and smeared onto a piece of toast, sprinkled with salt and pepper. Like butter, only better. And baked pasta. Lately, the everyday toss-some-pasta-with-tomato-sauce-and-call-it-dinner just isn't enough for me. Yet I haven't had the energy to cook up some elaborate pasta dish, with long lists of ingredients that take hours to chop and roast and simmer. The happy medium, I've found, is baked pasta. It turns the everyday pasta into something a little more special -- slipped into the oven to bubble in a bath of cheese and sauce, a topping of bread crumbs and extra Parmesan forming a crusty, golden-brown layer, cutting through to reveal hot, cheesy, comforting pasta that's far from your everyday and yet still simple enough to make after a long, cold day in dead-of-winter February. Yes. Now that's love. This particular baked pasta is perhaps the ultimate of all baked pastas: mac and cheese. I took the classic a step further for Murdo's and my tastes, adding prosciutto, peas and onions. Because that's how we show our love around here -- by making those foods that are "just the way you like it," that put a smile on your face when leaning over your bowl, and in the end, have you sitting back and rubbing your belly and just loving life in general, and the good food and good people that come along with it. Those are the best, really. As always, please don't take my measurements too seriously. I made this dish a week or two ago, and didn't write anything down, so I can't really be trusted. But go with your own tastes and gut, and the results will be delicious. This mac and cheese is so yummy and easy, it's sure to become a regular around these parts. Preheat oven to 400 F. Heat olive oil in a skillet over medium heat, and add onions. Cook onions until they are soft and have a nice brown color. I forget how long this takes, but it's several minutes, at least. Add garlic and prosciutto and cook a few minutes longer. Add the frozen peas until they are just heated through, then salt and pepper to taste. Remove from heat and set aside. In a medium saucepan over medium heat, melt the butter. Whisk in the flour and cook for about a minute, stirring constantly. Gradually whisk in the milk, and continue whisking vigorously until the mixture is thick and frothy. This takes about 8-12 minutes. Be patient. Stir in all but about 1/2 cup of the cheddar cheese and continue to cook, stirring to melt the cheese. Season with salt and pepper. Add the cooked pasta and prosciutto mixture, and stir to combine. Transfer to a baking dish coated with cooking spray, and top with remaining cheddar cheese, then top with Parmesan cheese and fresh bread crumbs (Or use plain bread crumbs from a canister. I won't judge you, because that's what I did, too.). 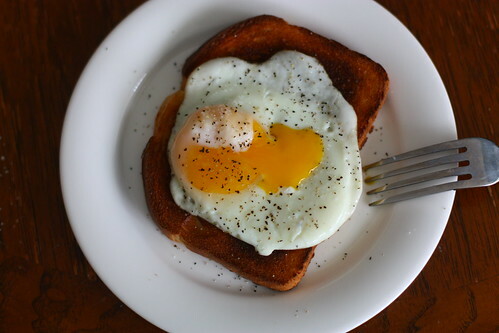 I love eggs always and forever! I know you said the mac and cheese serves 4, but I think in our case, it may only serve two. We are gluttons for pasta and cheese! And I never thought of putting peas in it. Anyhoo, happy love day...happy to read about your food loves. This post made me happy. Happy Valentine's, my friend! Avocado on toast is amazingly delicious and I've come to really appreciate eggs. Mac and Cheese with proscuitto?!? YES! How is it that toast is so delicious? By itself it's so simple -- yet a topping adds so much interest and unexpected deliciousness! mmm. 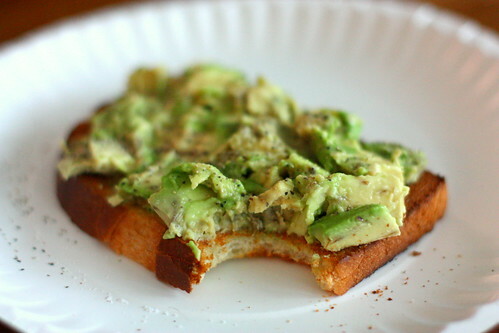 toast with avocados, one of my favorites. I like splashing some good olive oil and sprinkling it with salt and pepper. being spoiled by living in ca, I most of the time eat my avocados with pinches of salt and a spoon. Stephanie - Yeah for egg love! I've decided we need to meet someday, and it should be at an awesome diner, and breakfast must be involved. This mac and cheese technically only served two, too...but in a span of two days. And there really wasn't much for leftovers! NicoleD - Amazingly delicious is right. And yes, prosciutto in mac and cheese -- try it! Adds a nice salty bite. Boodle - Ha, after I wrote this post I was thinking I should add toast as a favorite food too, since those first two photos both include toast! But yeah, definitely an awesome vessel for more awesome food. Thanks for stopping by! Martin - Mac and cheese is definitely the way to a loved one's heart. Let me know how it turns out! These photos look like love to me! Hope you enjoyed your first valentine's day as a married couple! 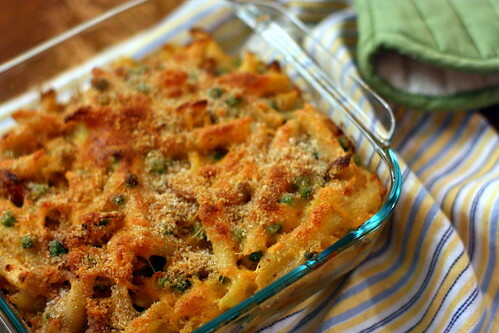 you can never go wrong with mac&cheese and I love the way the color of the peas pops so well. Antonietta - Thank you so much! Ryan - There is so much to explore in the world of mac and cheese! Haha thanks for all the great suggestions. Murdo would def. love the addition of sriracha. ChicaJo - Belated Valentine's to you, too, fellow forever-egg-lover! Ah, Jacqui, this is the perfect Valentine's Day post. You and I share a couple of Valentines, I see. I completely agree with the pasta substitute-butter on toast idea. i totally agree with all your loves they are mine too! identical list except mine would include some cake! can't wait to make me some baked mac n cheese i'm getting hungry! Jess - They're good Valentines. Oh so good. LetMeEatCake - I've recently found a new love for cake, also! Cake makes everything feel like a special occasion. 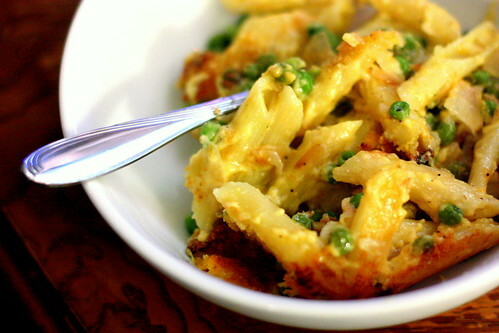 Peas and prosciutto are a favorite of mine, but I've never had them in Mac and cheese. sounds tasty! Jacqui, I can't get your photos of baked pasta out of my head! Now that I'm back in the Chi and it's at least 10-15 degrees colder than Virginia, it sounds like the best way to warm my insides. Maddie - Welcome back! Don't worry -- there is still plenty more Chicago winter for you to fill up on all your favorite comfort foods. :) Thanks for the sweet comment, always. Nice post. Now I want mac and cheese! What gorgeous photos. I am new to your blog, just wanted to say how lovely the pictures are. Ninette - Thank you! I'm learning that photos of mac and cheese are very, very dangerous.